The middle of our eye is filled with a clear gel called vitreous that is attached to the retina. As we get older, the vitreous begins to shrink. As it does, it separates from the inner lining of the eye, the retina. Usually, this separation occurs without any problems. However, because the vitreous is sticky, it can pull hard enough on the retina causing a retinal tear, or break in the retinal tissue. As this occurs, you may see flashes of light or lightning streaks in your vision as well as the development of new floaters. Flashes and floaters in themselves are quite common and do not always mean you have a retinal tear or detachment. Retinal tears can lead to a retinal detachment. Liquid vitreous can pass through the tear, lifting the retina off the back of the eye like wallpaper peeling off a wall. The retina does not function when it is not attached and the patient might notice a gray or black curtain or wall moving in over their vision from the outside towards the center. 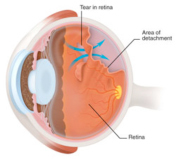 A retinal tear or detachment will require treatment. A retinal tear can typically be treated with laser therapy in the office. The laser creates spot-welds around the tear preventing fluid from getting through the tear and under the retina causing a detachment. A retinal detachment can be treated several different ways. Most times, a scleral buckle is placed around the eye. The buckle is a flexible band that counteracts the force pulling on the retina that led to the detachment. This procedure is performed in the operating room. Many times, the vitreous must be removed at the same time as the scleral buckle placement. This is called a vitrectomy. The vitreous is the substance that is pulling on the retina causing the detachment and preventing the retina from re-attaching. By removing it surgically, the retina is able to lay back in place along the inside wall of the eye. The vitreous is replaced with a gas bubble that holds the retina in place. The gas bubble gradually goes away with time. 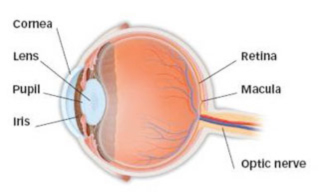 Sometimes, silicone oil is used to hold the retina in place if the retina needs long-term support. The oil does not go away on its own and usually needs to be taken out at a later date with another surgery.